While there are several apps which we can use for talking to our friends and loved ones, many of us still use the messaging app of iPhone. If you regularly use the messaging app, over time, if will be flooded with messages. Needless to say, these messages will consume the storage in your iPhone and can start affecting its performance if you do not regularly delete text messages from iPhone. Tap on Settings and select Messages. Look for Message History and tap it. You will now see three different options- 30 Days, 1 Year, and Forever. Select the one you prefer and your iPhone messages will be deleted after that duration. How to Clear Individual/Multiple Text Messages from iPhone? Simply open the messaging app. Look for the messages that you want to delete. Long press any message and it will allow you to select multiple messages. After selecting the messages that you want to delete, tap on delete. Apart from this, if you haven’t deleted the text messages from iPhone for a very long time, the above mentioned method for setting messages to delete after a period of time can be great. You can select 30 days and all the messages that were received in the last 30 days will be saved and rest will be deleted. It will then be much easier for you to check the messages of only 30 days and delete them individually. Is Deleting the Text Messages from iPhone Enough? Not really! While deleting messages will provide you with the some needed space, what about your privacy? Do you know that the things that you directly delete from your iPhone or iPad can be easily recovered? You can find hundreds of data recovery tools online that can be used for this. So, if you have some private messages in your iPhone which you delete before selling it, the other person can easily use one such tool to recover your deleted text messages on iPhone. 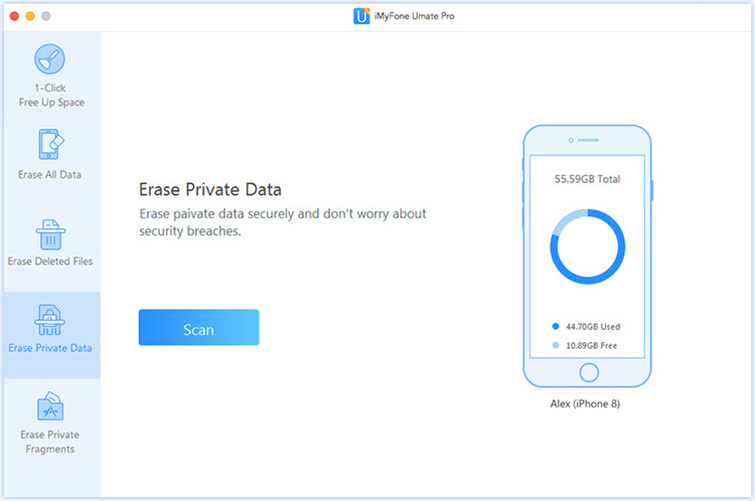 As a result, a much safer and simpler solution is to use iMyFone iPhone Data Eraser or iMyFone iPhone Data Eraser for Mac. The software is completely secure and is an excellent way to erase all your personal data forever from your iPhone. 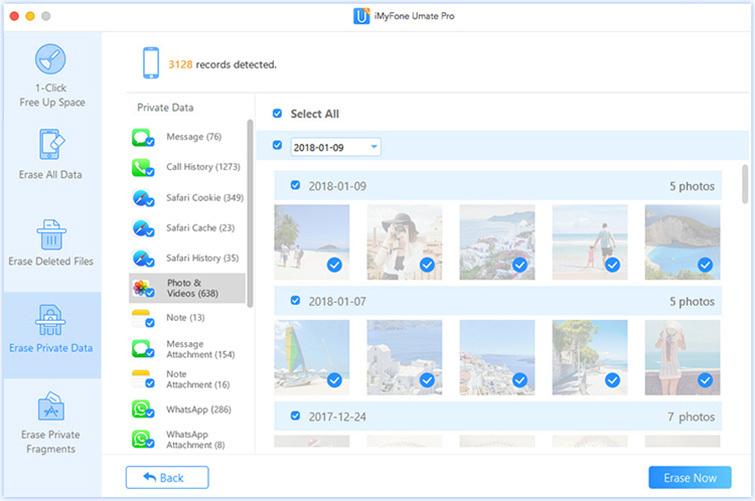 Apart from the “Erase Private Data” feature, the software also has the very useful function of “Erase Deleted Files”, which can be used to permanently erase the files that you had directly deleted from your iPhone in the past. 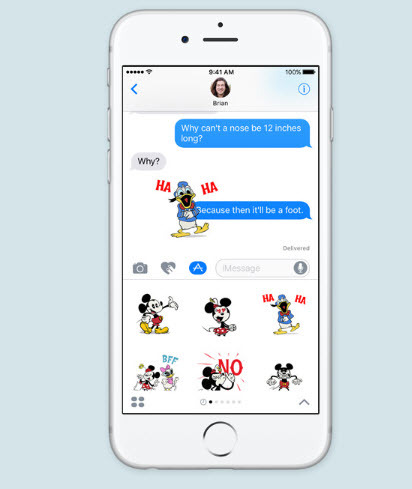 How to Permanently Erasing Text Messages from iPhone? 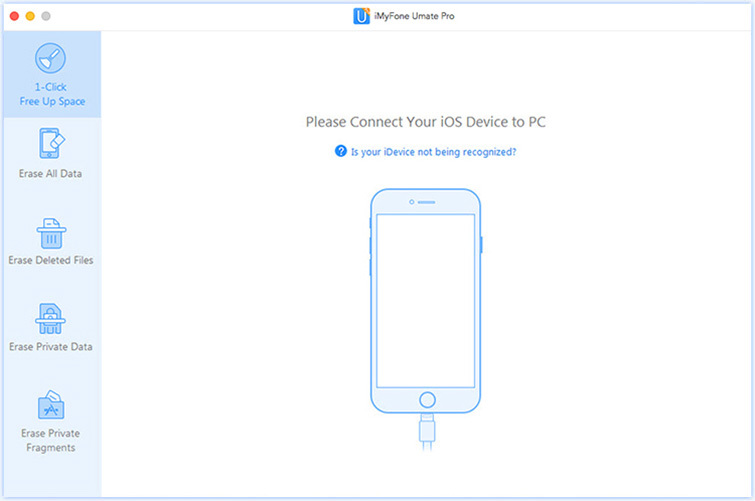 Step 1: Connect the iPhone to the computer after downloading and launching the software. Step 2: On the left side of the screen, look for “Erase Private Data” tab and click on it. Step 3: Click on Scan button on the next screen, and the software will then scan for all your private data, like messages, photos, contacts, etc. in your iPhone and will provide you with a detailed list. Step 4: Simply select the Messages you want to erase and you are done! 1-Click Cleanup: This feature is very useful as it allows you to instantly delete all the junk and temporary files from your iPhone. The program provides you with a detailed list from which you can easily delete the various files like app caches, temporary files, photos, videos, Apps. It also offers the option of compressing photos. Erase All Data: This feature can be used when you want to erase all the date from your iPhone. Make sure that you create backup of all the important files in your iPhone as this feature will delete all the data permanently. Umate Pro is a must-have tool if you are an iPhone-user. It is simple, effective, quick, and the best part is you can first download the trial version to check how useful the software actually is.